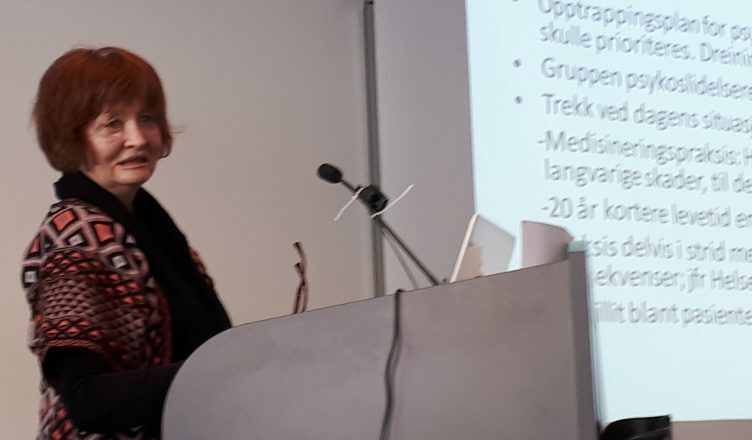 The 19th and 20th of March KBT was present at an interregional network meeting for the drug-free treatment services in Norway. KBT presented the preliminary results of our overview of the implementation of drug-free treatment services. Bjørg Njaa (image) from Fellesaksjonen for medisinfrie behandlingsforløp [the Joint action for drug-free treatment] held a presentation about the background of the demands of Fellesaksjonen. Fellesaksjonen, while not being against the use of drugs in psychiatric treatment per se, put forward that it is vital for patients to get the right kind of medication. Drug-free patient pathways must focus on teaching patients how to get to know and manage their own emotions, and how to create a better life for themselves. Fellesaksjonen are highly critical towards the use of medication with strong side effects. Over time this can be more harmful than helpful for patients. There is a great variation in treatment and intervention options in the different drug-free treatment services. Most drug-free treatments are established as a part of an ordinary DPS [District psychiatric centre] department or unit. Fellesaksjonen recommends establishing units that solely work with drug-free treatment, separate from ordinary services. Fellesaksjonen believes that establishing separate units will create a culture for working against the use of drugs in psychiatric treatment, even when patients might want medication. Njaa of Fellesaksjonen talked about the fact that treatment research is dominated by the pharmaceutical industry, and the damage of the publication bias that happens when negative research results are being held back from publication. Njaa also talked about the Norwegian documentary Cause of Death: Unknown.